How much time do we spend on social networks? We have developed a browser plugin as part of the Qowala project to track the amount of time we spend on social networks and you can already install it on Firefox. It is a small project that allows us to have at least one thing working among our great ambitions of the Qowala project. 21/02/2018 at 21h22 Update : the plugin has finally been published on the Chrome Store and I precised the members of the Qowala team. 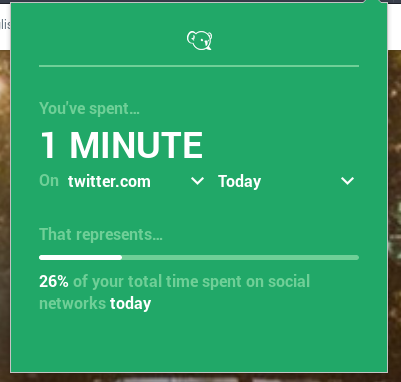 This browser extension allows you to track the amount of time you spend per day on social networks and to see the tracking over a week. It is already configured for the most popular social networks but you can also add websites yourself to follow, for example your Mastodon instance (as we can't guess the domain name of your instance) or even, you can follow websites that are not social media because there is technically no difference in the way we count the time spent. We made this plugin as part of the Qowala project (with Adrien Touminet and Antoine Beauvillain) to make people aware of the time they spend on social networks. Indeed, during the development of our Qowala service, we realized that in order for people to see a usefulness in controlling their social life 2.0 (the mission of the Qowala project), it is first necessary them to be aware of their use of social networks and that they want to change that. In short, lots of work needs to be done to raise awareness. We wanted to use the plugin to accompany a communication campaign with videos about our use of social networks. This means explaining that we can spend far too much time on these networks and lose productivity, that they can reduce the quality of our interactions with those around us, that they can misuse our personal data, etc.. However, we don't have enough skills to run this campaign, so we only have this plugin today. The plugin has been available for several months already on Firefox and is technically compatible on Chrome too (being a WebExtension), but it is necessary to load it manually because we didn't want to create an account on the Chrome Store. so you can also find it on the Chrome Store. The plugin is of course open source (more precisely, free software under the French CeCILL license) like the whole Qowala project and its source code is available on Github. The development of the plugin was a good experience especially because Baptiste Gelez contributed a lot to the point that today almost all the plugin code has been rewritten by him. Thanks to him for his invaluable help! You found an error in this article? Some advice? You can send a comment by email to "blog at killiankemps.fr" with "[Comment][en][How much time do we spend on social networks?]" as subject.